Settled in the McCullough Mountain range, MacDonald Highlands is the place for Las Vegas luxury. As multi-million dollar mansions find their place within the unique hillside community, large estate homes terracing into the hillsides or placed along the golf course are emerging quickly. Covering 1,200 acres, the hillside community of MacDonald Highlands boasts the lowest density for a planned community in the entire state. While it has been zoned to spaciously accommodate 1,150 homes, the actual development plan allows for a maximum of 800 homes to be built within the luxurious community. Within the MacDonald Highlands lush landscape, the heart of this exquisite development, DragonRidge Country Club abides. DragonRidge is a magnificent private golf course featuring 18-holes of pure genius. The MacDonald Highlands’ DragonRidge Country Club features another level of Las Vegas luxury living, providing a gourmet dining room with incredible views of the Las Vegas Strip, two mixed grills and lounges, a fitness facility, swimming pool and pro shop. A social membership to the clubhouse is provided to buyers upon application approval. 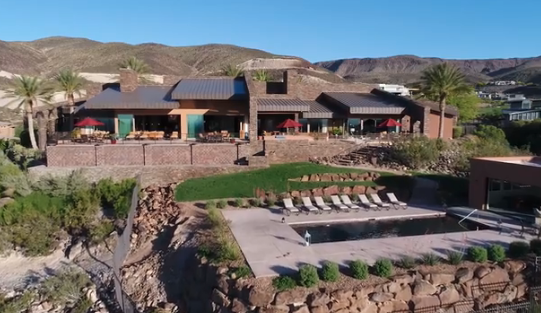 DragonRidge Country Club can be viewed from the Las Vegas luxury custom home lots along the hillsides. If you are homeowner looking for a new Las Vegas luxury home or a custom home lot, discover the heightened elevations and spectacular views of MacDonald Highlands. Our focus is to create a truly custom lifestyle. Find not only luxury but a personal touch to your future place of residence.